First I made the pastry, based on my normal pie pastry, recipe here. Just add a little saly and pepper to the pastry to make it a little more savory friendly. 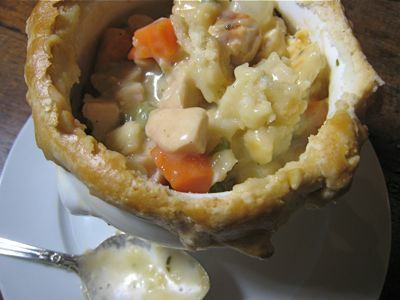 This recipe is loosely based on Ina Garten’s version of chicken pot pie, with several changes. Sprinkle some olive oil salt and pepper on chicken breasts and roast them in the oven until done. Remove the skin and chop the chicken into 1/2 inch cubes. You should use roughly 1 large chicken breast or 1.5 medium sized ones for each onion soup bowl like in the photos here. For 4 servings, roughly 4+ cups of chopped chicken breast. In a small pot, heat up 4-5 cups of chicken stock and add a concentrated porcini flavored cube or chicken bouillon cubes to intensify the flavor of the stock. In a enamel pan, melt about 1.5 sticks of good butter, saute some chopped onions, until cooked, some 10 minutes. Add 3/4 cup flour and mix into the butter and onions then add all of the hot chicken stock and whisk to blend this all together. Lower the heat and watch the sauce thicken over the next mintue or two. Add salt to taste, freshly ground black pepper, and 1/4 cup of heavy cream. Add the chopped chicken, chopped carrots, peas, baby onions (I used bottled onions that were drained and rinsed), and some chopped parsley leaves. You can add some sauteed mushrooms (not too watery) to the mix as well. Divide the filling into the four bowls and cover with pastry and brush with an egg wash and bake for about an hour in a 375F oven until nicely colored. Serve a few minutes later and warn guests they could burn the roofs of their mouths off if they aren’t careful. The verdict on taste? A solid 8 or 8.5 out of 10.0. Not bad for a “white” dish. This was rich, hearty and delicious without being overly heavy. Adjust your filling to include a greater proportion of veggies if you prefer it that way. 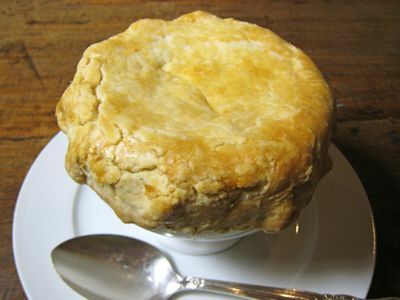 This is very similar to a “pastel” which tends to have tomato sauce, but I liked this classic chicken pot pie. And it is great for entertaining as you can make this ahead, cool the filling, assemble and then just pop into the oven an hour before you sit down to dinner. Yum! Mind you, with that much butter and some heavy cream, how can you go wrong??? Sinful but worth every calorie. You can also try making a rich and thich cream-based soup, put it in small ramekins and cover with your pastry. 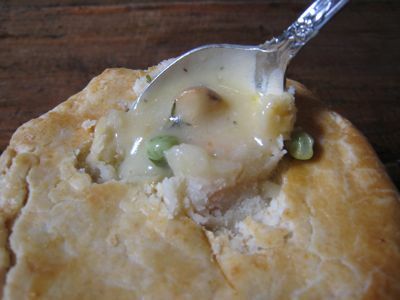 We like making a good 3 mushroom soup and cover it with some pie pastry. I sprinkle some white sugar over the egg wash to give it an unexpected hint of sweetness. Yummy!!! I am a fan of white food as long as it doesn’t taste of pure cream. The first picture looks great, i can just imagine the steam rising as you first break the crust… We usually make pastel, more of pot pie really since it’s white, in a big pyrex dish and cover the whole thing with crust (lattice pattern if masipag) for Xmas. I add in my herb of the month (thyme, herbs de provence, tarragon,etc) for a twist on the taste. And for texture, some water chestnuts. The kids love it. Didn’t know there is a pastel variation with tomato sauce. My pastel has always been with white sauce . BTW, MM, with all that butter and cream, I thought you were on a diet. Hmmmmmm. while living in california, i too avoided dishes cooked in cream like a plague, because of the fat/calories thing. but since moving to france, i’ve taken to it and quite enjoy the taste that i have also started cooking with crÃ©me fraiche legere(light). haven’t gained any weight yet! I too have new found respect for white sauce after learning how to make it properly (non dairy-creme tasting) and even more decadently with the addition of a drizzle of truffle oil. On another note, are you privy to any piece of information on Tony Bourdain’s visit to the Philippines? I’m a HUGE fan. my husband would love this!!! i always buy the frozen marie callender’s frozen chicken pot pie for him because i’ve never baked pot pies before. oh, i take that back… i think that i’ve done it once long time ago. i think that it came out good. it was a recipe from nora daza’s cookbook. hi mm! i do this @ home sans the crust due to time constraints. also, instead of the white sauce, i use condensed cream of chicken soup & marinate the chix in lemon & soy sauce for a few minutes before cooking. i also add fresh mushrooms & sliced vienna sausage. yum!!! What a coincidence! I’m having chicken pot pie right now! I love it especially if it was made with fresh green peas and carrots! Can you tell me where I can buy tahini? Also, do you have recipes on how to make hummus, tatziki and baba ghanoush? That journal entry whetted my appetite. Ummmm….makes me hungry…Will try it without the crust..sounds so good. Hi Joan, I don’t know where you’re based but in Manila you can get tahini from Assad and other Indian groceries along UN Avenue. There’s also an Assad in Jupiter St, Makati. looks yummy! 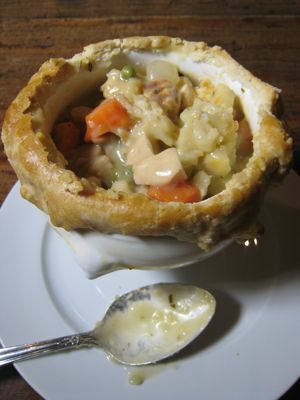 sadly, i can’t try out the recipe anytime soon so i just have to find really good chicken pot pot pie after work. MM, what brand of chicken boullion do you use?